A few years ago we wanted to examine what exercises would be most helpful for serious arm training. As always, we used a numbers approach. We used a group of volunteers to test over a dozen arm exercises to determine which ones generated the highest intensity of overload. By ‘high intensity’ I mean, the total weight lifted per unit of time. 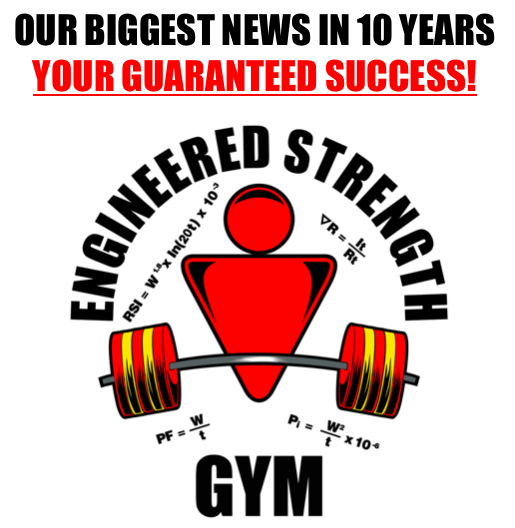 So if one biceps exercise allowed the trainees to lift, on average, 1,250 lbs per minute but another biceps exercise generated 2,840 lbs per minute it was deemed the superior exercise. After all, the biceps is always attached at the same two points on the bones and it always contracts in the same direction so if one exercise imposes twice the intensity, what reason would there be to use the lower intensity exercises? Anyway, at the end of the testing there was a clear winner for the forearm flexor muscles that move the wrist. It’s an exercise you rarely see used in the gym but it had the highest intensity by a clear margin. It’s a wrist curl behind the back. Here are some photos of three ways it can be performed. 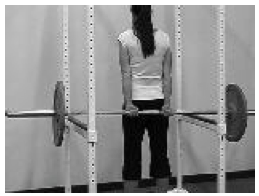 You have to have someone place the bar in your hands or perhaps take it off a rack if it’s at the right height. Alternatively, you can just place the bar in a power rack and then you don’t need a spotter. You can also use a low pulley, but remember the weight on the stack is likley not the real weight you are lifting after if runs through a few pulleys. Still, if you always use the same machine you can ensure progressive overload. There isn’t much range of motion in this exercise so it’s a minor point as to whether you use a full range, partial range or a static hold. The most important thing with this exercise – and indeed any exercise – is to calculate the intensity so you can increase it on future workouts. Static Contraction trainees know their intensity because they always do 5-second holds and the weight must increase for higher intensity per 5-seconds. Power Factor trainees can calculate Power Factor and Power Index numbers to monitor their momentary and sustained intensity. Most full-range, conventional trainees just train blindly insofar as intensity is concerned. I can’t leave you not knowing the antagonistic exercise to this one. 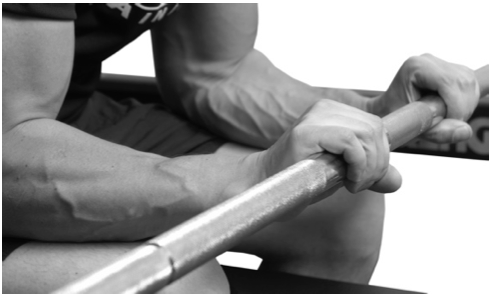 The highest intensity exercise we tested for the forearm wrist extensors was the seated barbell reverse curl. Here’s a photo. OK, Popeye, go have some fun in the gym experimenting with these. I am so glad you posted this. I have been doing Static Contraction & I have been wanting the answer to this question for a while. I use Captains of Crush grippers and have been wanting a way to progress with them. Maybe this will help. I have never tried the wrist curl behind the back. It looks pretty simple. Anything to know about how to do it correctly? It’s a simple exercise and hard to do wrong. Just don’t let momentum do the work, keep it slow and controlled. In regards to grip strength, obviously you can make your best gains in your strongest range, as you have proven over and over. But I have to be honest I don’t know what the strongest grip range is. Have you tested whether you have more strength when the hand is fairly flat with fingers mostly extended or if you are stronger with the fingers closed like a fist? Just looking for more ways to make my training better. For me, it’s fairly linear. If I can get a gripper moving I can usually close it. Cheating it to partially squeezed then finishing properly doesn’t help much. Your mileage may vary. That makes sense but grippers seem get noticeably harder the more close to a full close it is. I guess I was just wondering if I should do partial closes with heavier resistance/weights, or if I should work on doing full closes with heavier resistance/weight in order to build strength the fastest. I see. Well my advice would be to do it in the range that lets you work with the most weight. Say the gripper is set to 50lbs and you can only move it halfway closed. Do that. It’s likely better than reducing it to 40 lbs just so you can close it. (Of course if the calibration is crazy and it’s only 30 lbs when you start and 50 at the end, that is a different matter.) But whatever it is – the key is progression from workout to workout. Pete, I’ve been using a Jackhammer to good effect for some time now for grip. I am 63 y.o. and have presently achieved 167.5 pounds, and last time I tested with a Jamar Dynamometer I was within a half pound for both right and left hands. Has anyone ever looked at the Jackhammer for comparison with other devices for grip? And, would you have any input on whether or not the Jackhammer does anything significant for the flexors and extensors? I love that JackHammer and I hope they start making them again. I’ve never run a comparison study with it and another machine. (There are very few grip machines widely available – how often do you see one in a gym?) I can’t quantify what grip exercises do for forearms but you can feel both your flexors and extensors working when you close your empty fist. That said, the barbell wrist curls and seated reverse wrist curls have maximum effects. I do have your train smart book. 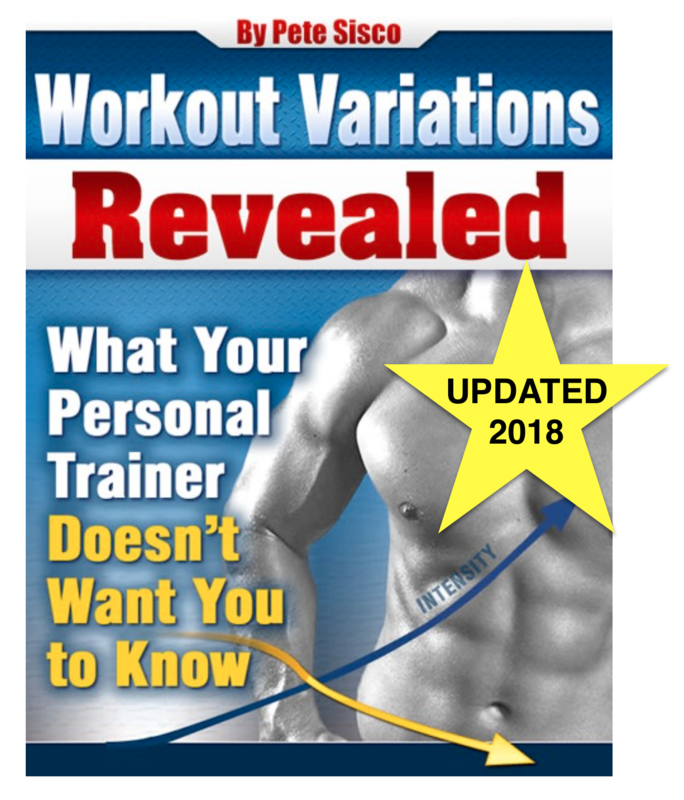 It’s funny how some people in the high volume and frequent training school say “the way low volume approaches work is because some who use them are genetic freaks and can gain on anything” they truly think the goal is to increase work capacity until people are able to train daily and grow by constantly varying exercises. I mean it works for some even regular people. Like crossfit and Westside barbell where it’s a lot of regular people training there. It’s for people who love training and being in a gym. How do they recover though? I think maybe by their daily workouts they get in better shape and endurance and burn more calories to rip their muscles up. Almost like aerobics the more you do and more frequent the better. Yet for muscle growth the true key is more rest decreased training. It’s to tough for most to stay out of the gym so they come up with constantly varying exercises in order to train daily and make some progress. 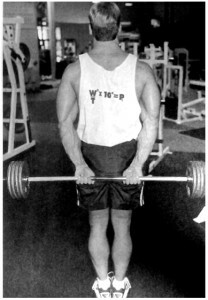 Even then both shoulder raises and military presses ultimately work the should muscle so how does that work for them making progress with adding more frequency at say a Westside barbell club? Muscle, like hair and fingernails, takes time to grow. Frequent workouts does not reduce that time and often extends it. Mike Mentzer used to say, ‘They take a social need and elevate it to a training system.’ They WANT to be in the gym as much as possible so they look for reasons why that might be smart. It’s fine to a point, but when they say the people who want to train as little as possible in order to get the same health benefits are wrong they reveal their bias. Again, maybe I can tolerate ten aspirins a day – but if one aspirin every two days solves my problem, why would I hammer my body at the limits of what it can tolerate? (Unless I just love hammering my body. Which some do.) Think of the mindset of someone attracted to a workout that says it’s “INSANE!” and why he would think that is ideal for him. What does that say about his priorities? He wants abusive exercise at the limits of what his body can withstand. I’d bet he’s young in age or young emotionally and has something to prove to himself. And that’s fine. But don’t elevate it to an essential training methodology. Definitely makes sense. Thanks Pete. I DO love the JackHammer myself but I can definitely see the need for the flexor curls and extensor isolation curls too. Thanks for your insights. i would have thought the overhand thick bar pull up (like a rack pull but overhand) was the best…?